Of coffee mugs, boxes, and me – So where are you now? Today I missed my coffee mug. One of my favorite things to do is take coffee back to bed with me in the morning. I spend an hour or two reading, catching up on news or podcasts, listening to music, or just staring into space. It’s an absolutely delicious way to start the day, and it’s one of the many reasons I am happy I don’t have to rush out the door to make it to a job anymore. The apartment where I’m currently staying is incredibly comfortable and fairly well appointed. My greatest complaint is the lack of a sizable mug. Today I finally gave up and took two smaller cups back to my bedroom; it was particularly early, and I knew I needed to hibernate for a good while longer. 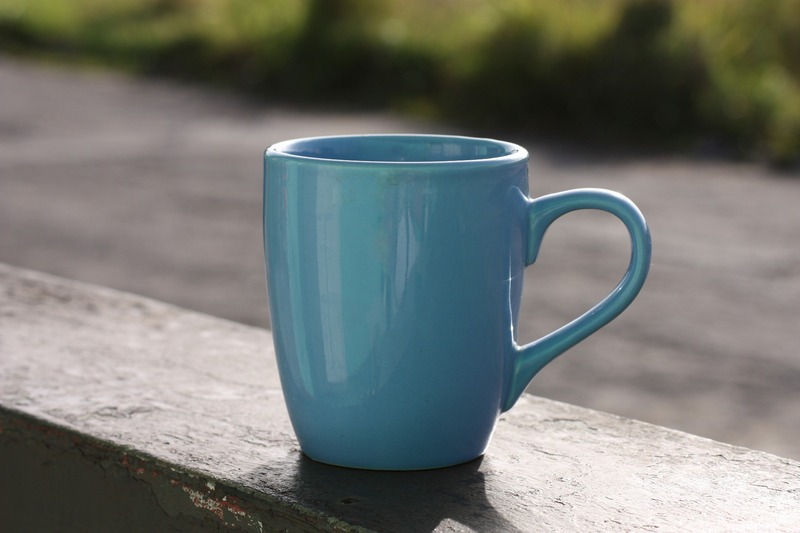 I found myself longing for the blue behemoth that had been my mug of choice in the past few years – the one that held enough coffee to keep a family of four awake for days and fit so beautifully into my hand. It was not a mug that had particular meaning: indeed, I don’t even remember how it came into my life. However, for the two years I used it, it seemed to represent beverage receptacle perfection. Before I cut the strings and went nomadic, I went through a process of culling my belongings. As I have written before, I have spent much of my life making moves between cities and countries, which I have always used as an opportunity to lighten my proverbial load. This was even true in the days when my employer paid for packers to box everything up and ship it to wherever I was headed next. In fact, the process of sorting, donating, tossing, giving, and recycling has become so connected with transition in my mind that I launch into it the moment my inner change junkie starts getting restless. Nonetheless, this was the most drastic purge of them all. I set myself a goal of keeping only what would fit into about ten boxes, which I am happy to say I reached. In the months that led up to heading out on the road, I can honestly say that I held everything I owned in my hands. It was an intense experience, and sometimes even looking at a simple ticket stub would create such an overwhelming wave of emotion that I had to put things down and do something else – anything else – to distract myself. Along the way I discovered I was unconsciously lugging around a few “little boxes of sadness,” as my friend Christa dubbed them. I’m not altogether sure why certain things created such a difficult reaction, but I think it had to do with saying good-bye to former versions of myself. I’m pretty glad to be where I am today, both literally and figuratively – but to rehash things I once was or thought I would be was challenging. Getting rid of items associated with these former “me”s was liberating, but it also tested any sense of self actualization I thought I had achieved. Luckily, there was also a flood of warmer emotions as I was reminded of fun times, personal accomplishments, and friends who while no longer in my life enriched my being at some point in time. I had to get rid of some these items with more positive connotations as well (space becomes a precious commodity when you have only ten boxes to fill), but that was valuable, too. I spent time imprinting associated memories in my mind, said my good-byes, and sent things off to continue own paths through the universe. As anyone who has gone through something similar can attest, it’s not always the easiest of exercises. Some days I was in top form and purged like a maniac, while others I had just reached my limit and had to pretend that nothing was happening. I don’t think undertaking such a process makes me virtuous; the time was just right for me to divest. If others feel the need, they should heed the call – but if hanging on to things is what their hearts desire, well, that’s their prerogative, too. I was surprised to realize this morning that that damn coffee mug is the first thing I have missed since I started living out of a suitcase. This is an amazing feeling, as it somehow validates all of the other things I got rid of. An apartment full of stuff, and in 12 months I get one pang of longing for a piece of pottery? I’d say that’s not bad. If anything, it makes me wish I had been even more ruthless about getting rid of things earlier. Most items are indeed replaceable, if you decide you really can’t live without them. There’s also something to be said about the excitement of finding new things and for bringing new energy into your life. I think it’s also dangerous to get too attached to any object, as just like humans they have a lifespan. Coffee mugs break, jewelry gets lost, and clothes wear. It’s inevitable. It seems healthier to recognize that objects are transient. I am grateful for all of the assorted items that have passed through my life over the years: those that have served me, those that have brought me joy, those that are full of good memories, and those that represent assorted challenges – and thus growth. I am also thankful for all of the versions of me that accepted each of these items into my world at some point in time. I celebrate you all and welcome whatever objects and versions of me may appear in the future. For now, however, I honor the small cup in my hand, what I have in my suitcase, my ten boxes, and the me of the moment.